Jose Aldo proved to be the best featherweight fighter on the planet for nearly a decade. The Nova Uniao product was the UFC’s inaugural featherweight champion and also the former WEC featherweight champion. 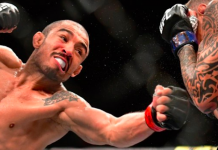 From 2006 to 2015, Jose Aldo strung together an incredible eighteen-fight win streak. 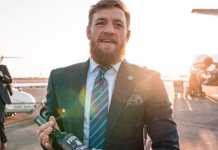 During that time he beat the likes of Hall-of-Famer Urijah Faber, Chad Mendes, Frankie Edgar and Ricardo Lamas, the who’s who of the UFC’s featherweight division. 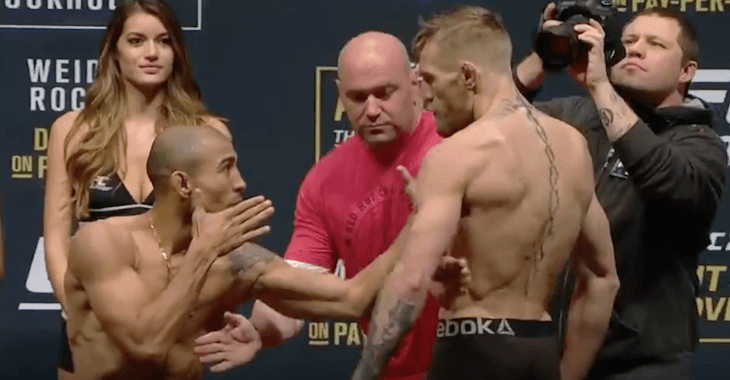 However, after that stretch, Jose Aldo suffered a shocking 13-second knockout to Conor McGregor at UFC 194 in 2015. Since then, Aldo has gone 2-2, suffering two TKO losses to current UFC featherweight titleholder Max Holloway. In his most recent effort, Jose Aldo scored a first-round TKO victory over Jeremy Stephens at July’s UFC on FOX event in Calgary. Even after all he has accomplished at featherweight, Jose Aldo knows that another title shot will be hard to come by as long as Max Holloway remains champion. 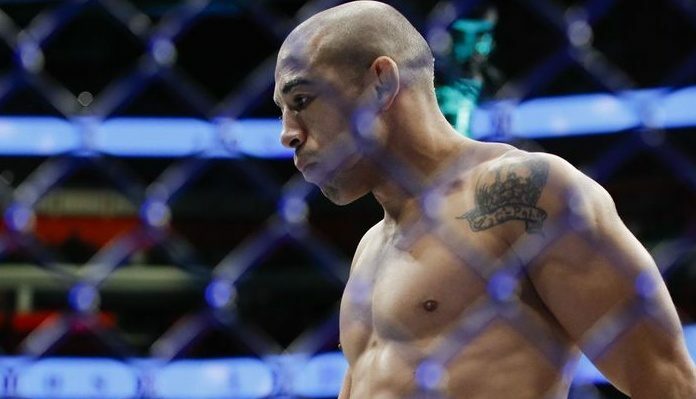 Due to that, Aldo recently expressed his interest in a potential move up to lightweight, with his eyes set on UFC 231 in Toronto. With that in mind, here are three possible lightweight matchups for the former champ. Justin Gaethje vs. Aldo is a fight a lot of fight fans would love to see. Whenever Gaethje fights, there is a good chance it will be a fight of the night contender, and possible fight of the year. Aldo had a very entertaining fight in his last effort against Jeremy Stephens where the pair stood in the pocket and traded blows until a body shot from Aldo sent “Lil Heathen” to the canvas. Imagine that same fight with Gaethje instead of Stephens, it would be one for the ages. Looking past Gaethje’s excitement, why this fight makes sense is simple. Gaethje recently just fought on August 25th where he won by first-round knockout. With the win, Gaethje got back on track after two straight losses, and also didn’t take much damage. So a return to the octagon in December makes sense. A win over Gaethje would put Aldo in the title picture at lightweight. There have been rumours of Kevin Lee fighting on the Milwaukee card in December, but nothing has been officially announced by the promotion. The Milwaukee card is a week after UFC 231, so if Lee was ready to fight on that card he should be ready to fight on the pay-per-view card. Why fighting Lee makes sense for Aldo is pretty straightforward. 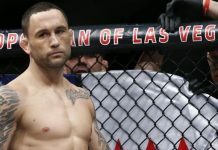 Lee is currently the number five lightweight and with a win over Lee, Aldo has a strong case for the winner of Conor McGregor vs. Khabib Nurmagomedov. Especially if Conor wins as Aldo has wanted that rematch since being knocked out by the Irishman. Both Lee and Aldo are both good on the ground and can both stand-up and trade shots if they choose. 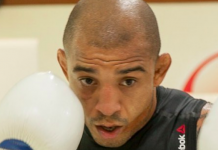 It would come down to who is the better fighter that given day and for Aldo it would be a risk worth taking as he could jump the queue to the title with a win. Al Iaquinta’s stock grew tremendously after he lost to Khabib in Brooklyn back in April. Following the loss, Iaquinta still hasn’t returned. He was supposed to fight Gaethje in August but pulled out due to injury. With Iaquinta ready to return in August but had to pull out due to injury, December could be a good return for the New York native. For Aldo, most of the top lightweight’s are booked and if he had to fight Iaquinta he could still make his mark in the lightweight division as Iaquinta is currently ranked number nine. Iaquinta is a wrestler which would be a unique matchup for Aldo, but he has defeated wrestlers before in Mendes and others. While Iaquinta surely won’t bring Aldo’s stock up that much, a win over him would put Aldo one to two fights away from a title shot at lightweight. Whoever Aldo ends up fighting in his lightweight debut it will be interesting to see how he fares at the division, given he has been a featherweight for most of his career. Aldo has options at lightweight and it will come down to the UFC matchmakers to decide which one is the best for the Brazilian.